Answer 64 questions in 30 minutes and print out a 10 page interview, tailored specifically for the job for which you're hiring. Available with the purchase of a Manager Tools Personal License. 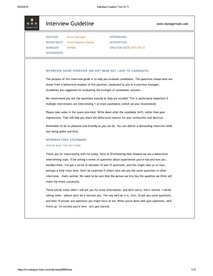 Effective managers ask questions related to the core skills required for the job. That means analysing the job in advance. That's what the tool helps you do. How you can tell a good answer from a bad one. The tool tells you what to look on for every question. The most effective questions are behavioral. "Give me an example of". "Tell me about a time when". With room to take notes, because you're going to probe. Every interview has introductory text and you can add as many custom questions as you need, specific to your job, your company, and you. 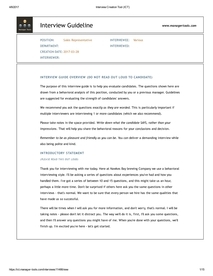 Below are examples of interviews that Licensees have created, as samples. 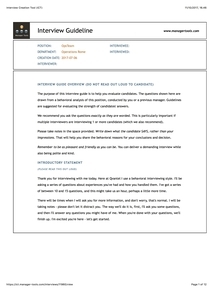 We caution you NOT to just print out one of these interviews and use it to interview candidates. The Interview Creation Tool creates a very specific interview based on the 64 questions and the weighting YOU give them. By skipping that step, you will have an inferior interview. Until I started using the ICT I was clueless. My last six hires have been "A" and "B" employees. The best part is that I knew they were that good BEFORE I made the offer. I'll do whatever it takes to get results like I have from the Interview Creation Tool! This product is available with the purchase of a Manager Tools Individual License.